Less-than-perfect, NEW Giell-brand White Poly/Foam Manikin Head with sculpted facial features - Lightweight dimensional styro body parts for Halloween Haunt prop-making supply or target practice! Inexpensive holder for displaying or storing Wigs, Masks, Caps, Hats, Novelty Sun Glasses, Headphones, Scarves, Necklaces, Costume Jewelry, etc. Add make-up, paint, eyelashes, masks, hair for a more realistic-look. 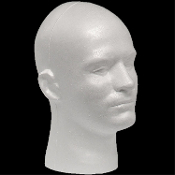 Styrofoam Sculpture Head can be used to create realistic masks or busts. It is the size of an actual human head. *We also have headform face covers in male and female versions that fit either style styro heads. They're already made up with a man or woman's dummy face for an easier way towards a more realistic look! They cover the front of the head and velcro around the neck. Just add a wig, hat or hood to complete the look! *These are brand new dimensional white foam heads in slightly less than perfect condition. Some have small dents and/or slightly flattened noses from being packed in the box too tightly. Sold as-is and is final sale. This item cannot be returned. Contact us and we'll check for you!